Appearance: Two raw edges, with row of stitching or machine stitching, three-eighth to one-half inch from edges, Which are afterward neatly trimmed and overcast (for undergarments). Fig. 118. - Plain seam. Use: Petticoats, dress skirts and aprons. To make: Place two right sides of cloth with seam lines together (if traced), otherwise the two edges of cloth; pin, keeping traced lines together, pins at right angles to seams; baste through tracing, with small even basting for garment or petticoat. Sew with stitching or machine stitching beside the basting, not through it; clip and remove bastings, trim edges of seams evenly and overcast. 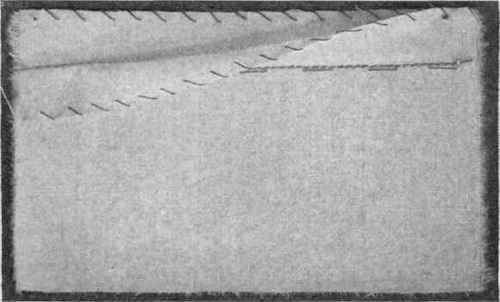 Plain seams are sometimes pressed open before overcasting (Fig. 118). Appearance, double thickness, smooth finish. One stitching visible. Use: Corset covers, underbodices, night-gowns, petticoats, lingerie dresses. To make: Place the wrong sides of cloth together, match the tracings, if used; if not, the two edges of cloth; seam on right side of cloth. Pin tracings together as in plain seam and baste. Stitch the seam one-eighth inch outside seam tracing; trim to one-eighth inch or less. 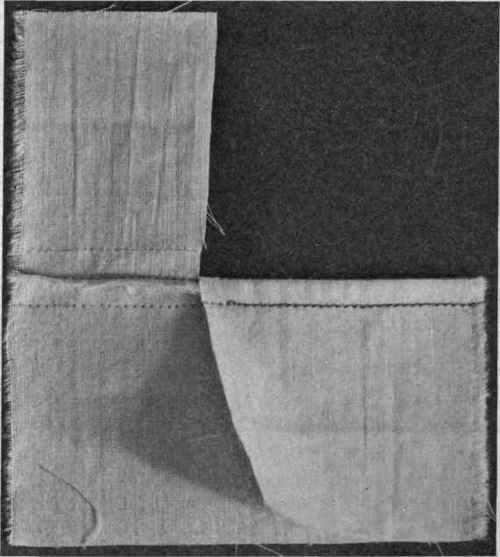 Crease seam flat, then turn so that two right sides are together, line of first seam directly on the edge; baste, and stitch so as to cover the raw edges of the first seam (Fig. 119). Fig. 119. - French seam. Appearance, flat finish, one-quarter inch wide or less, showing two rows of machine stitching or one row of stitching and one of hemming or overhanding. Use: Corset covers, underbodices, drawers, petticoats. To make: Hemmed Fell. - Place two right sides of cloth together, having seam lines meet if traced; otherwise two edges together. Baste on tracing, stitch so that the upper side, of the stitch comes to the right side of the seam. Trim the under side of the seam to one-eighth inch, then turn the wide edge over the narrow one; lay both flat on the cloth. 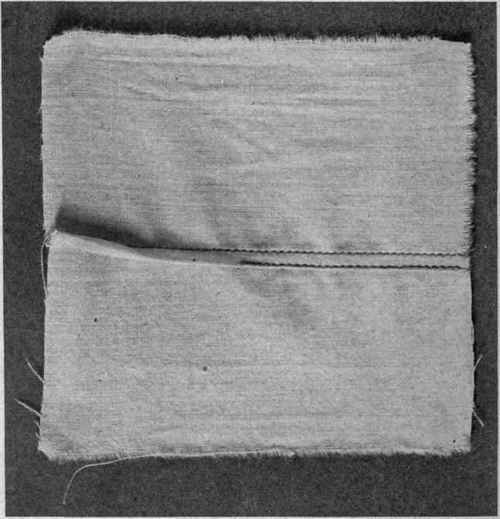 Hem the edge of fold to the cloth (Fig. 120). Stitched Fell. - Same as other except that both seam and fold are stitched by machine. Finish stitched fells on right side, therefore baste with wrong sides together (Fig. 121). Fig. 120. - Hemmed fell. Same as hemmed fell, except the cloth is folded back on a line with the fold of the fell and over-handed as in French hem (Fig. 122). Place two right sides together; stitch seam three-eighth inch from edge. Trim under side and baste fell, not turning edge. 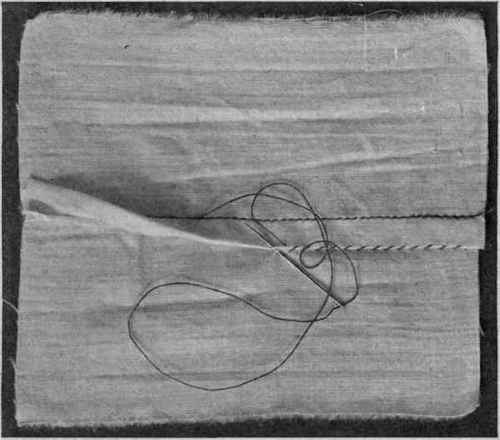 Catch-stitch edge (Fig. 123). 2. Finishes. - Hems. - A hem is a finish made of the cloth itself or of an additional piece of cloth for the edge of garments or parts of garments. There are three kinds of hems which may be used; these vary in width. Fig. 121. - Stitched fell.